When it comes to home building, renovations and purchases, little needs to be left to the imagination thanks to new technology, such as a 3-D home-design software package. Real estate professionals have used 3-D renderings to help buyers visualize their dream homes. Thinking of buying or selling your home? Click Here and Discover the value of your home or neighborhood. During the recession, many industry experts said the days of the McMansion were over, but in the past three years, the average size of new homes has grown significantly, according to a new Census Bureau report. Click here to find out how much your home has increased in value. The Conference Board Consumer Confidence Index®, which had improved in May, increased again in June. The Index now stands at 81.4 (1985=100), up from 74.3 in May. The Present Situation Index increased to 69.2 from 64.8. The Expectations Index improved to 89.5 from 80.6 last month. Find out what your home is worth in today’s improving market by visiting http://www.clarkransom.com and clicking on the Market Insider Tab. A good first impression is important in real estate. Online appeal gets buyers to view the home in person, and curb appeal gets them in the door. With 90 percent of buyers looking for homes online, listing photos are crucial and should not be blurred or distorted, taken at the wrong time of day, or overly focused on furniture or other items. When it comes to curb appeal, here are some suggestions for sellers: Read more…. The overall number of listings on Zillow was down 12.2 percent year-over-year at the start of June, an improvement from the 17.5 percent shortfall recorded in January. For more information and a detailed market analysis of your home or neighborhood, visit http://www.clarkransom.com. Nationally, asking prices increased 9.5 percent year-over-year in May, but in the 10 least affordable metros, asking prices spiked 16.3 percent during the same time period, according to Trulia. WASHINGTON (MarketWatch) — Existing-home sales rose in May to the highest pace since November 2009, when buyers were rushing to make a tax-credit deadline, pointing to a continuing recovery, the National Association of Realtors reported Thursday. What Happens if Fannie Mae and Freddie Mac go away? Is the Mortgage Food Fight finally over? FHA Foreclosure Waiting Period now getting shorter. 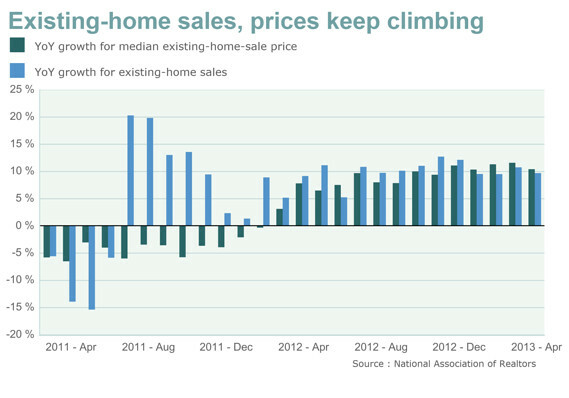 Is Housing Inventory getting better? Does Owning a Home make your Kid Smarter?